They killed me. They healed me. They changed me. Sure, the life of a graduate student wasn’t exactly glamorous, but it was Merit’s. She was doing fine until a rogue vampire attacked her. But he only got a sip before he was scared away by another bloodsucker–and this one decided the best way to save her life was to make her the walking undead. 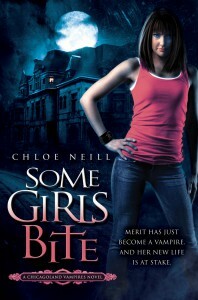 Turns out her savior was the master vampire of Cadogan House. Now she’s traded sweating over her thesis for learning to fit in at a Hyde Park mansion full of vamps loyal to Ethan Sullivan. Of course, as a tall, green-eyed, four-hundred- year-old vampire, he has centuries’ worth of charm, but unfortunately he expects her gratitude–and servitude. But an inconvenient sunlight allergy and Ethan’s attitude are the least of her concerns. Someone’s still out to get her. Her initiation into Chicago’s nightlife may be the first skirmish in a war–and there will be blood. Note: I am an Amazon affiliate and may earn a commission if you buy goods at Amazon through one of my links. Meritversary Contest – Enter to Win the Last Cadogan Medal! 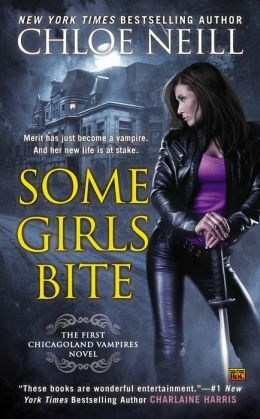 SALE ALERT – SOME GIRLS BITE ebook only $1.99!